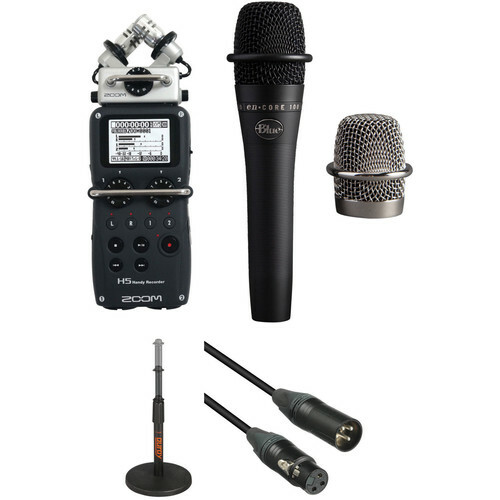 This Zoom H5 Recorder Podcast Kit with enCORE 100 Mic from B&H brings the elements necessary to begin recording a 1-person podcast within minutes of opening the box. The Blue enCore 100 dynamic microphone features a cardioid pickup pattern that does a great job capturing speakers near the mic but without picking up unwanted sounds further away. The included Auray telescoping tabletop stand makes positioning the mic a snap. The XLR cable plugs right into the H5 recorder, which features high-quality mic preamps and records to an SD card. The H5 sports a second XLR/TRS input when you're ready to add a second guest mic, and it can be expanded to accommodate up to four mics with the EXH-6 dual XLR/TRS combo input capsule (available separately). With easy-to-reach controls for on-the-fly adjustments, the system is fully standalone but also ready to interface with a computer for live streaming or for more elaborate post-production work. The black enCORE 100 Dynamic Handheld Vocal Microphone from Blue is a studio-grade, 3-pin XLR cardioid microphone that reproduces your voice exactly as you hear it. With its hand-tuned capsule, it can be used for capturing audio in live stage, vocal, studio tracking, and TV broadcast applications, and more. Featuring exceptional detail and clarity, the microphone has internal copper windings, which are wound for optimal frequency response and pulls the blanket off your sound. This lets the audience hear your voice in clear, natural quality. In addition, for public speaking the enCORE 100 maximizes speech intelligibility. Simply put, this microphone makes sure your message is heard with power and clarity. It even minimizes handling noise and feedback. It includes a microphone clip, a storage pouch, and an additional chrome microphone grille. The black TT-6220 Telescoping Tabletop Microphone Stand from Auray meets the needs of any desktop audio applications that require the use of a microphone by providing a solid, weighted round base with three nonslip rubber feet for additional stability. The telescoping shaft delivers flexibility when it comes to positioning the height of the microphone and includes a microphone cable guide. Durable steel construction ensures longevity. The black Kopul Premium Performance 3000 Series XLR M to XLR F Microphone Cable (6') is designed to be an extremely quiet and flexible cable that is ideal for the most demanding live sound and performance applications. The cable is engineered to be durable and to provide protection against EMI, RFI, and static noise. While the cable's color-coding affords the ability to quickly differentiate between multiple connections on stage, it provides a pleasant aesthetic quality at the same time. Box Dimensions (LxWxH) 12.95 x 6.7 x 4.15"
Box Dimensions (LxWxH) 7.05 x 7.05 x 1.9"
Box Dimensions (LxWxH) 3.5 x 0.9 x 0.2"